If you’ve not yet heard The 98%, it’s a podcast that pulls no punches and is surely responsible for many a beverage snorted in laughter and astonishment. 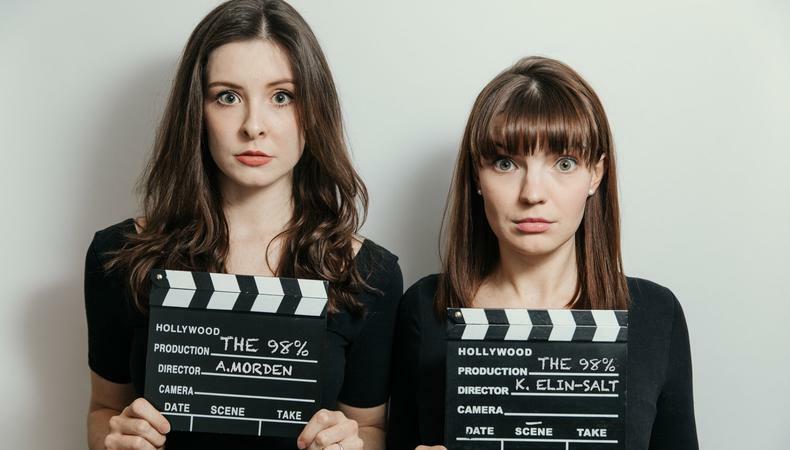 Listening to hosts Alexa Morden and Katie Elin-Salt discuss the ups and (mostly) downs of being an actor is like overhearing the best conversation in a pub. Yes, it’s funny – but it’s also heartbreakingly honest. After a first series that covered everything from changing into audition outfits in public loos to coping with rejection, the pair are back with a second instalment. Backstage sat down with Alexa to find out how it came about and what’s in store for the new series. Why did you want to start a podcast? I remembered a survey from a few years back that showed only 2% of actors earn more than £20,000 a year from acting work. That’s less than the living wage, so only 2% of actors pay their way with acting work alone. Which leaves 98% of us paying the bills in different ways. Yet you would never know from social media as all we ever see is new showreels, what people are filming, people going to auditions. All this makes you feel like you’re the only one going through the tough times when in actual fact it’s 98% of us. That figure is who we represent and it’s a reminder that we’re not alone. What issues did you want to talk about? The first ones were “resting jobs,” mental health, and coping mechanisms for being out of work. As we did the episodes we could do by ourselves we thought of what we would have wanted to hear when we started in the industry, so we spoke to Annie Rowe who’s a casting director, touched on low or no pay with Equity and talked honestly about drama school. So, much of the podcast is about changing our ideas. One of those is how we view success. If we view success and “doing well” as acting work, we’re telling ourselves we’re unsuccessful when we’re not acting. But why can’t success be going to work behind a bar for nine hours, learning lines on the way home, doing a self-tape, and getting up the next day to see a show in the West End you’ve saved for months to see? It’s about knowing this industry is hard and changing how you view certain things to make it a tiny bit easier. It doesn’t solve everything but it helps. Has making the podcast changed you? Totally. It’s changed my day to day of being an actor. I’ve had six years of giving everything to the industry and getting about 0.05% back but now I’m realising that I want to make sure I’m enjoying life in the meantime. We say in the podcast that you shouldn’t put your value on getting an acting job, and no acting job is for life. I’m now doing things for me, not putting everything on being an actor. Maybe saying no to a casting because I’ve already booked a train ticket to see my friend in a play. I wouldn’t have done that last year. If you could point new listeners to the best of Series 1, what would it be? The first one would be Episode 5, our most downloaded episode. I talk to my dad, who’s a psychologist and coach, who travels the world doing talks, and he gives practical advice on picking yourself up from knockbacks, how to handle nerves in an audition room – really simple things that we go through all the time but don’t actually have a way of getting better at or managing. Then, the very final episode of Series 1. A lot of people start there and cry with laughter. We’re always impassioned and make jokes, but here I tell a classic actor’s life story that has everyone groaning in solidarity. And because by this point we weren’t scared of anything, we speak candidly and honestly about being an actor. That episode shows you what we’re about. What can we expect from Series 2? We’ve done a lot of talking. So, we wanted to pass the mic to other people in the 98% who may have had experiences that we can all learn. We’ve got a new format called The Green Room where we chat to people about their experiences, and our first two are Elliot James Langridge, who’s an actor with dyslexia, and Robyn Holdaway, who’s nonbinary. We’ll also be talking to Mike the Hamley’s Elf! Katie and I don’t discuss what job we’re doing, neither do our guests, because it doesn’t matter what stage you think someone’s at, we’re all going through the same things. If people want to hear actors talking about great roles they’ve done, directors they've worked with, and stages they’ve graced or whatever – that’s not us. We’re everything else. Series 2 of The 98% starts 4 March. Follow the podcast on Twitter.